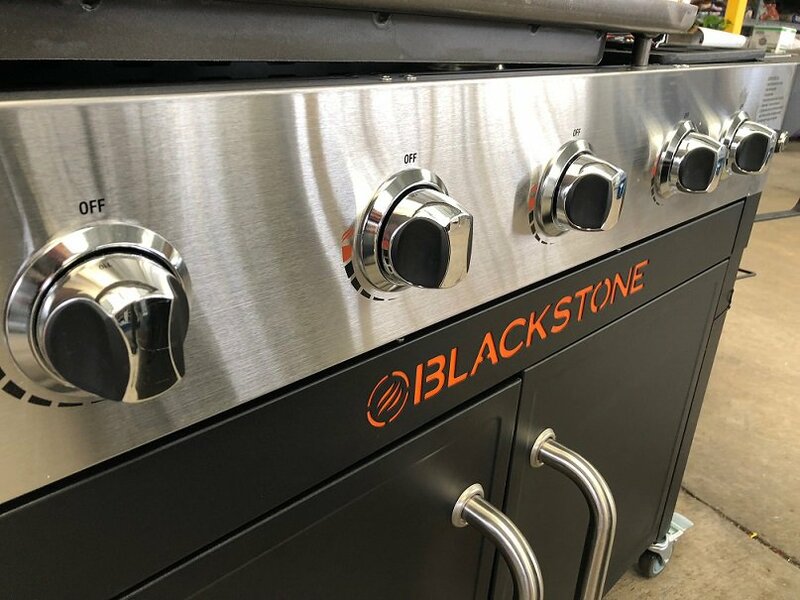 The Blackstone Range Top Combo is a visually stunning outdoor cooker that, currently, is only available at Wal Mart. 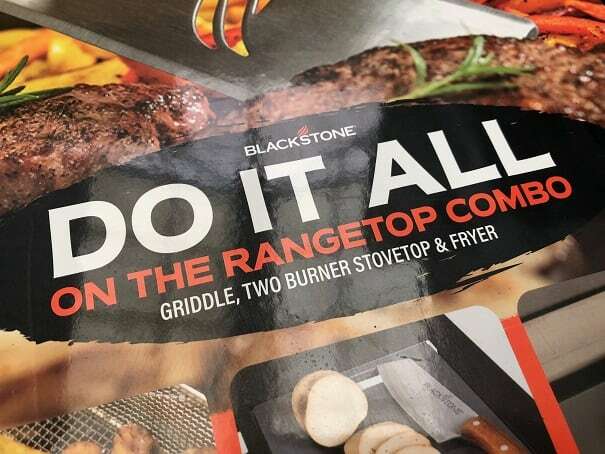 The Range Top Combo consists of a three burner 28 inch griddle coupled with dual side burners and a deep fryer. Both the griddle and the side burners are fitted with hard top hoods for protection when not in use. Here is a more hyped up semi-official promo video introduction to this beauty! There are a ton of features that I love about this cooker. To start with, the front of the Combo, with its stainless control panel and orange on black stenciling, is beautiful to look at. I would be delighted to have something this pretty sitting on my deck. I also like that this is a 28 inch griddle with three burners. 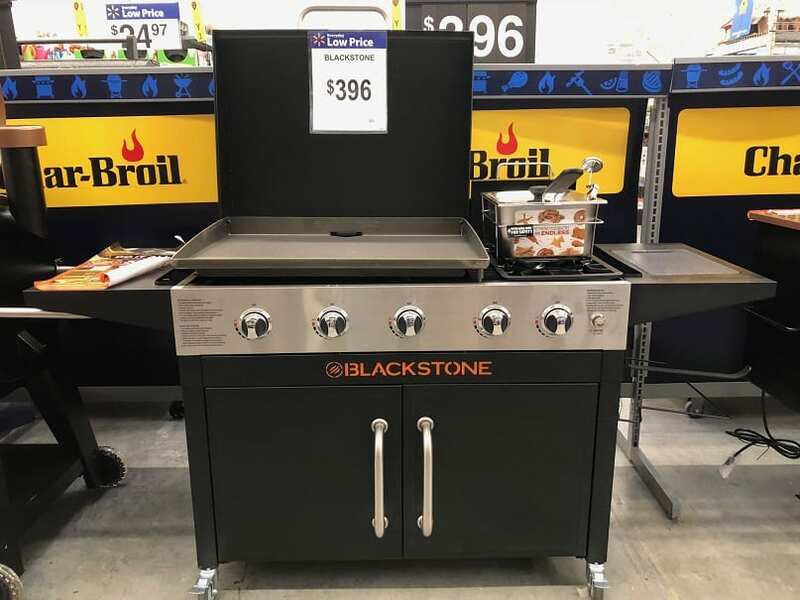 The stand alone 28 inch griddle from Blackstone only has two burners. The extra burner on the Combo provides greater flexibility in terms of temperature zone management. I do not know if the third burner on the Combo lets the griddle get hotter than a stand alone two burner griddle. The two burner griddle is rated for a heat input of 34,000 BTU/hr. The Combo is rated for a heat input of 55,000 BTU/hr but that also includes the two side burners. The dual side burners are SWEET! The Dual burners come with a one gallon deep fryer that locks into place so you can’t knock it over. When the burners are not is use you can store the deep fryer in the lower cabinet and cover the burners with the hard top hood. You can do a lot more with the side burners than use them for deep frying. You could use them to make a pot of chili and use the chili to top some hot dogs. You could use the burners to boil some pasta that you could then throw on the griddle for some stir fry action. There are some nice practical touches with this product. You get two working side tables and one of them has a built in cutting board. There is a rod to hold a roll of paper towels and even a bracket to support a 14 gallon trash bag. The griddle was designed to make it easy and fun to use! Another design feature I appreciate on this product is the enclosed lower storage cabinet. 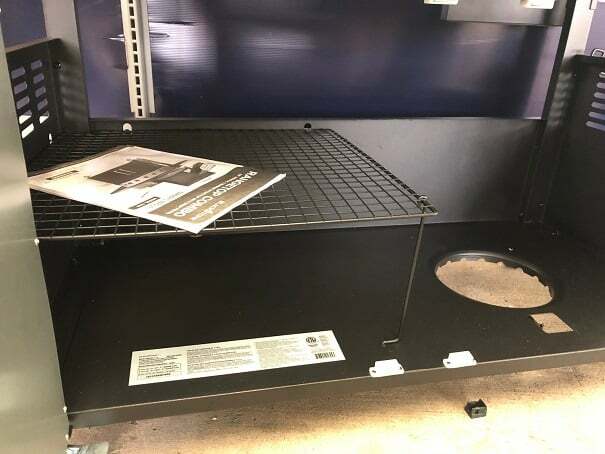 There is plenty of space down there to store the deep fryer and any other griddle accessories that you might have. The cabinet is also where you store the propane tank and it is nice to have that out of sight. Overall I love the Combo but I really dislike the hard top hood that provides protection for the 28 inch griddle. More specifically, I do not like how the hood is attached to the griddle. The hood is permanently attached to the griddle with a pivoting screw on both sides of the griddle. This means that when you use the griddle the hood must be lifted into a straight up position. With the hood straight up you have two problems. The first problem is that the hood is now positioned like a giant sail and I would not want to use the griddle on a windy day! The griddle is pretty dang heavy so I don’t think a big gust of wind would cause the whole thing to blow over but it also isn’t something that I want to worry about. The second problem is that when you are cooking on the griddle your view is completely obstructed by the giant hood in front of your face. That might seem like a little detail but think about having a bunch of folks over to your house for a party. 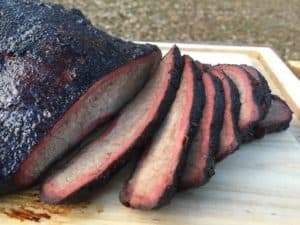 Everyone is kicking around in the back yard having a great time and you will be standing there staring at the back side of a griddle hood. Blackstone sells detachable hoods for all of their other griddles and I wish the Combo had a detachable hood as well.